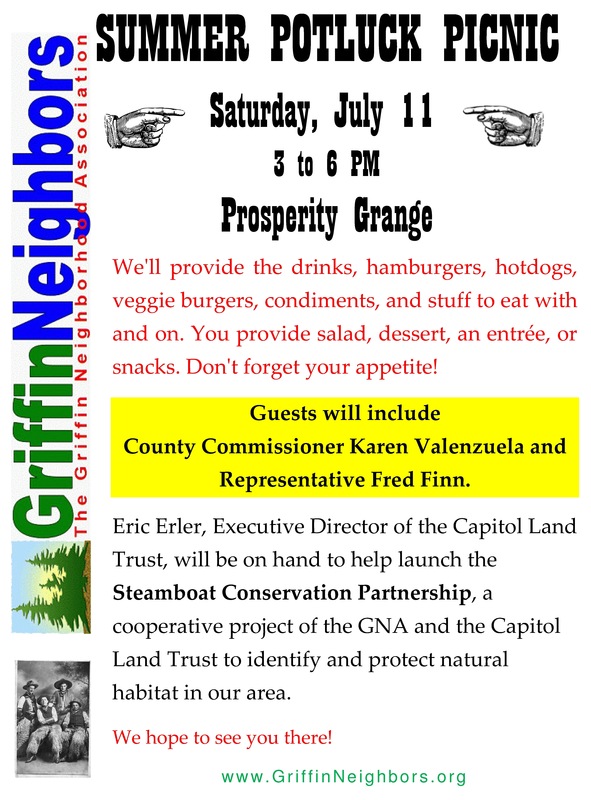 Local residents filled Prosperity Grange this last Saturday to attend the Griffin Neighborhood Association’s annual Summer Potluck Picnic. Many brought salads, desserts, and snacks to add to the burgers and hot dogs cooked up by GNA Board member Beau Altman. Board member and past GNA President, Gary Goodwin, acted as Master of Ceremonies for a program that included comments by County Commissioner Karen Valenzuela, Representative Fred Finn and Capitol Land Trust Executive Director Eric Erler. Around the perimeter of the dining room were arranged displays from the GNA, the newly-formed Steamboat Conservation Partnership, the GNA’s emergency preparedness project, and the Puget Sound Restoration Fund. Karen Valenzuela described her principal goals as a County Commissioner. Of particular interest to many in attendance is her interest in determining whether it is appropriate to assess impact fees on development in unincorporated portions of Thurston County. Impact fees are typically assessed in order to offset the costs of building out infrastructure required to support higher population densities. Presently, the County does not assess impact fees. Although the Growth Management Act and other regulations seek to focus development in urban areas, the absence of impact fees could make it cheaper for developers to build outside the Urban Growth Areas. By assessing impact fees, the County could take an important step to “level the playing field,” Valenzuela said, and remove an incentive to creating urban sprawl in our region. Valenzuela, who was appointed by the Governor to fill out the term of Commissioner Bob Macleod, is running for election this November. Ballots for the primary election will be in the mail within weeks. Click here to read a piece regarding her candidacy. She has both a Democratic and a Republican opponent, who we’ve profiled previously on this blog. Invoking a quote by Otto von Bismarck (“Laws are like sausages, it is better not to see them being made.”), local resident, GNA Board Member and 35th Legislative District Representative Fred Finn described the last legislative session. The focus of the next legislative session is likely to continue to be the budget, Finn said. Among the bills Finn successfully shepherded to passage, this last year, was a bill which re-emphasizes the use of reliable, high-quality science in Puget Sound cleanup. Another bill authorized the use of safe, alternative refrigerants in a motor vehicle’s air-conditioning equipment, and another rescued Mason’s County McKernan fish hatchery from closure. A fourth bill guaranteed tougher punishment against those who damage to or steal from Christmas tree farms. After introductory remarks by Dave Schuett-Hames, President of the GNA, Eric Erler, of the Capitol Land Trust, stepped up to describe the creation of the Steamboat Conservation Partnership. This is an exciting opportunity for local residents to fund efforts by the Trust to identify property right here on the Steamboat Peninsula – activities to conserve special natural areas in the Steamboat Peninsula region and that maintain connections between these lands through corridors useful for wildlife movement. Examples of special natural areas include marine shorelines, estuaries (including pocket estuaries), freshwater streams and riparian habitat, prairies, wetlands, and upland forests. Erler described a pocket estuary, on Totten Inlet, which has already been identified and which the Trust is currently working to preserve. This property has been described in a recent article that appeared in the Olympian. The editorial board of the Olympian also wrote a fine piece regarding the creation of the Steamboat Conservation Partnership in today’s newspaper. Click here to read that editorial. 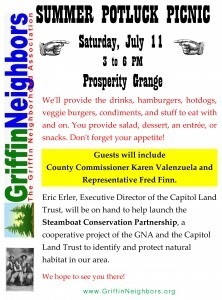 Many thanks to the Prosperity Grange, for allowing us to hold this year’s picnic in their facility. Thanks also to the many neighbors who brought food and contributed their time, their bar-b-que grills and their ice chests to this worthy and very enjoyable event.